Street atlas of New York City’s five borough from Hagstrom in a large (almost A3) spiral-bound format, with additional enlargements for the Theatre Land and Lower Manhattan, a map of the subway network and ferry routes, plans of the JFK and La Guardia airports, an overview road map of the NYC environs, etc. The main section of the atlas showing NYC at 1:17,500 is arranged by borough: Manhattan, Brooklyn, Bronx, Queens and Staten Island, as is the accompanying index which for each one also has a separate list of places of interest, schools/colleges, parks, libraries, etc. Streets are annotated with block numbers for easier identification of addresses. Numerous places of interest highlighted – many, but not all, are named. 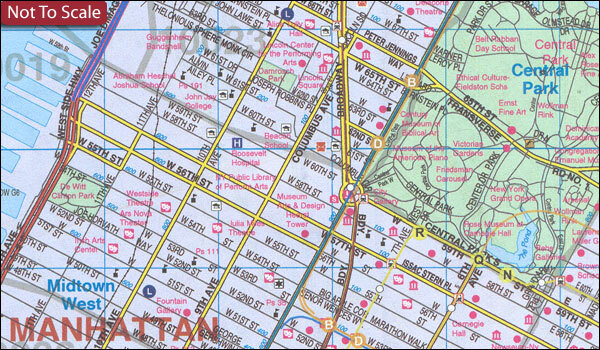 The maps show subway lines with their letter designations; stations are marked but not named. 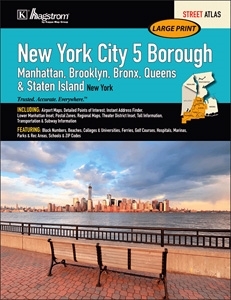 Additional features include: enlargements for the 5th Avenue - Theatre District area with names of theatres, shops and other businesses/buildings, plus of the Lower Manhattan; a map of the subway network plus information on ferry services, PATH trains, tolls on bridges and tunnels, etc; plans of the JFK and La Guardia airports; a road map of the city’s environs; notes on the city’s main sights, beaches and parks; postal zones maps with addresses of post offices, etc. IMPORTANT – PLEASE NOTE: some names, particularly in the additional plates (subway diagram, Theatre District map) but also in the main section, are in very small print.